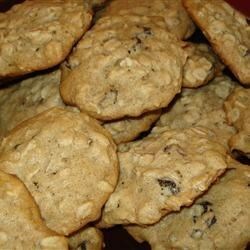 "Spicy oatmeal cookies with the tangy zip of buttermilk." In a large bowl, cream together the butter and brown sugar until smooth. Beat in the egg. Combine the flour, baking soda, nutmeg, cinnamon and allspice; stir into the sugar mixture alternately with the buttermilk. Mix in the oats, walnuts and raisins. Drop by rounded spoonfuls onto the prepared cookie sheet. Good cookie, but too cake-like for my liking...great flavor though and buttermilk is a nice touch! They were too moist. They did not keep at all. Tastes like spiced cake. Cookies are also quite cakey. Being that I prefer crunchier cookies, I will not likely make these again.